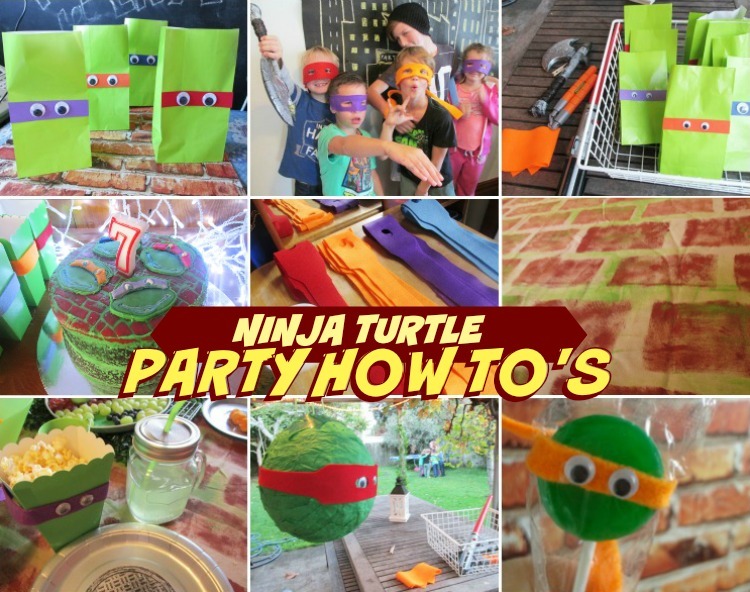 It was about time that I finally posted the tutorial for our Teenage Mutant Ninja Turtle Party (seeing as it was nearly three months ago now). 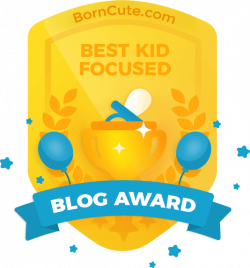 In this post I'll show you how to do all the cool-but-simple things that made our party so cute-and-fun. 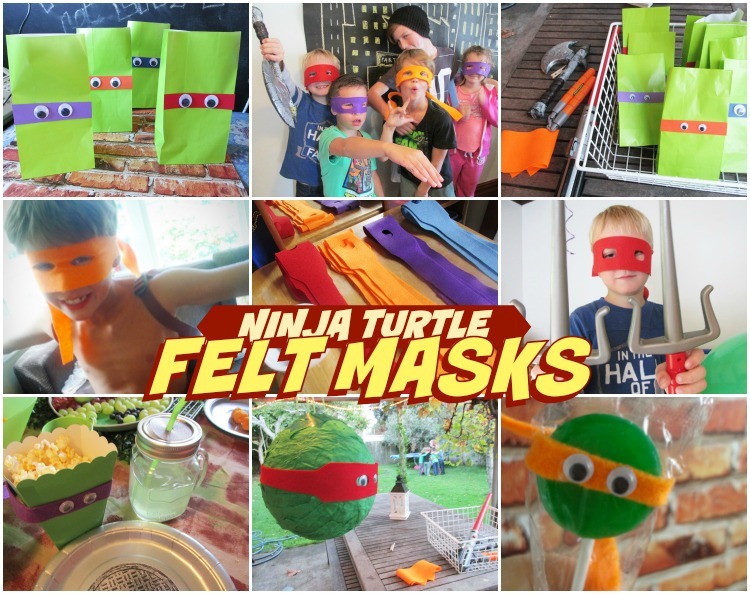 Like the Ninja Turtle Piñata, the cute Ninja lollipops, felt masks, the brick-stenciled table cover, that Turtle Face Fruit Platter - and of course the CAKE. 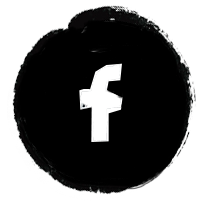 It's all here in this post. 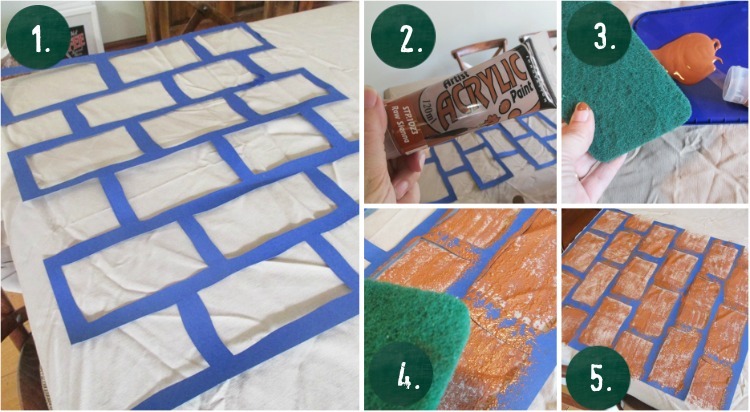 Next, rip the green serviettes in large strips and layer over the still-wet papier mâché. When your papier mâché is completely dry and hard, pop the balloon and strengthen the edges of your hole with green duct tape. 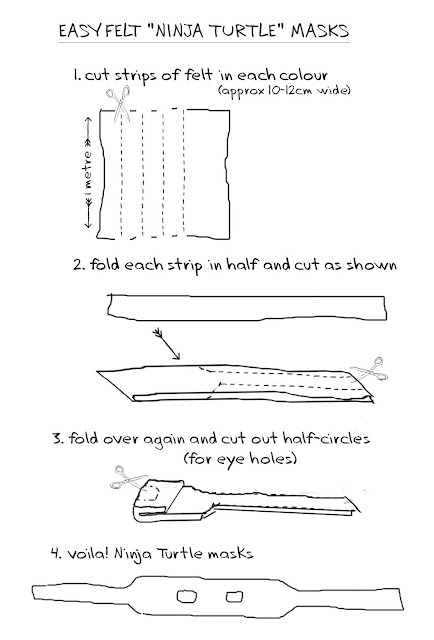 then use a craft knife to poke four holes and thread with your hanging string as shown. 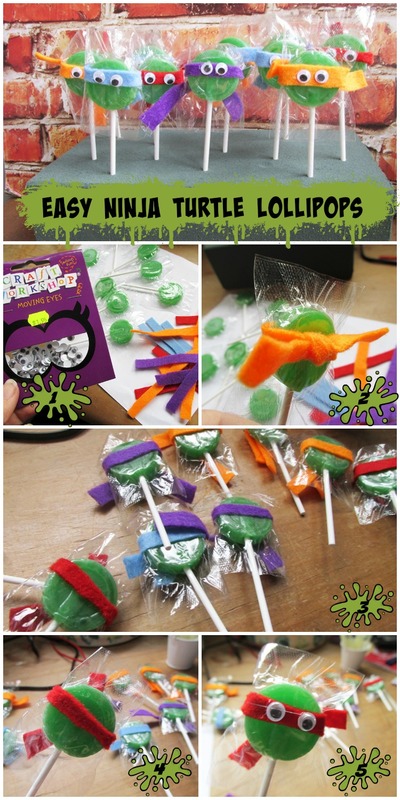 Fill your turtle head with the wrapped sweets; hang it up and bash the heck out of it, while blindfolded - Great Fun! With a clean sponge, dab on some green for "moss/slime", as desired. Allow to dry - that's it! I bought half a metre each of Red, Purple, Blue and Orange felt from my favourite Emporium (Geoff''s) for $3/metre. 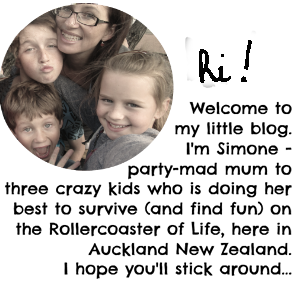 This was more than enough make all of the following "masks", perfect for easy theming. Glue on the eyes. Repeat. Voila. Done. These are so easy you really don't need much by way of instruction! Purchase plain green paper "goody bags" and popcorn boxes - I found mine in a dollar store for $2 per pack. Cut felt strips for the "masks" - approximately 12mm wide. I cut mine long enough to go right round the popcorn boxes, but shorter for the goody bags, to cover just the "face" of the bag. 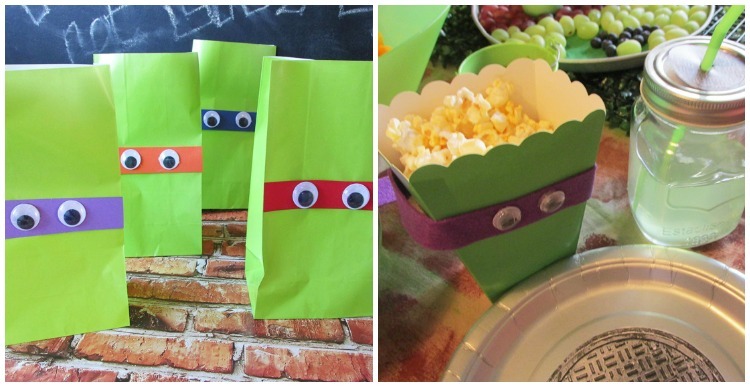 For the popcorn boxes, use a glue gun to secure the masks onto the bags/boxes. 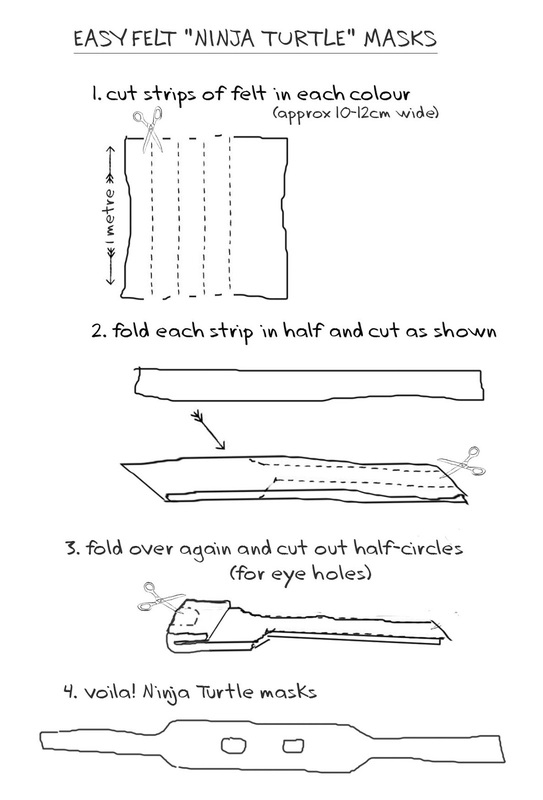 Glue on your googly eyes (I used medium sized ones). That's it. After baking your cake in two layers and letting it cool, sandwich your cake together with green buttercream. Now we're up to the fondant, so assemble your equipment. I work on a silicone baking mat with a sheet of baking paper over the top. This prevents the rolled fondant sticking, and also makes it easy to move and place on the cake later. Place your (cleaned) cake tin on top of the fondant and use a fondant cutter (or sharp knife) to cut the embossed fondant into a circle. Voila! You have a brick-embossed round sheet of fondant ready to top your cake. Place another sheet of baking paper over the top of your circle and carefully pick it up and flip it over. 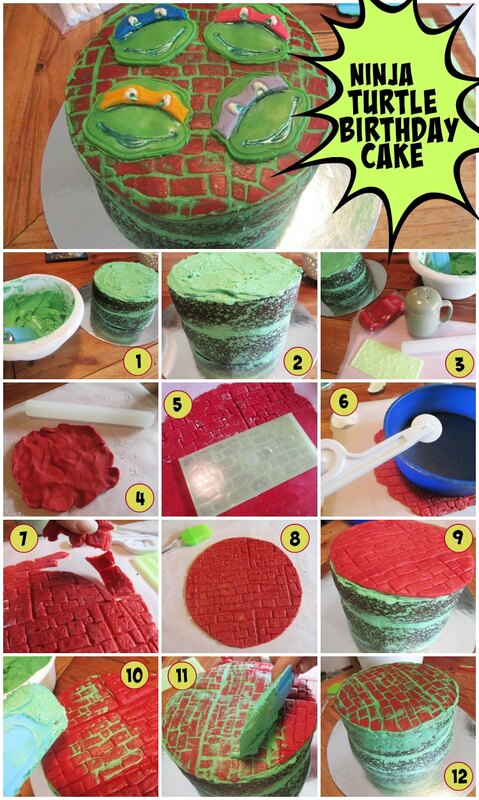 With the rubber spatula, smear some more green buttercream onto the brick fondant, then scrape off. The buttercream will lodge in the grooves like grout. 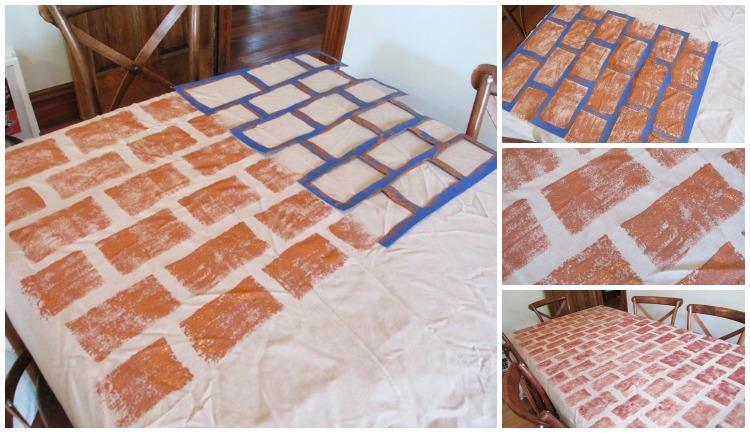 Repeat the process until all the bricks are "grouted". You could skip this part if you prefer, but I like the "slimy mossy" brick effect for the ninja turtle theme. Next, we make the Ninja Turtle faces. 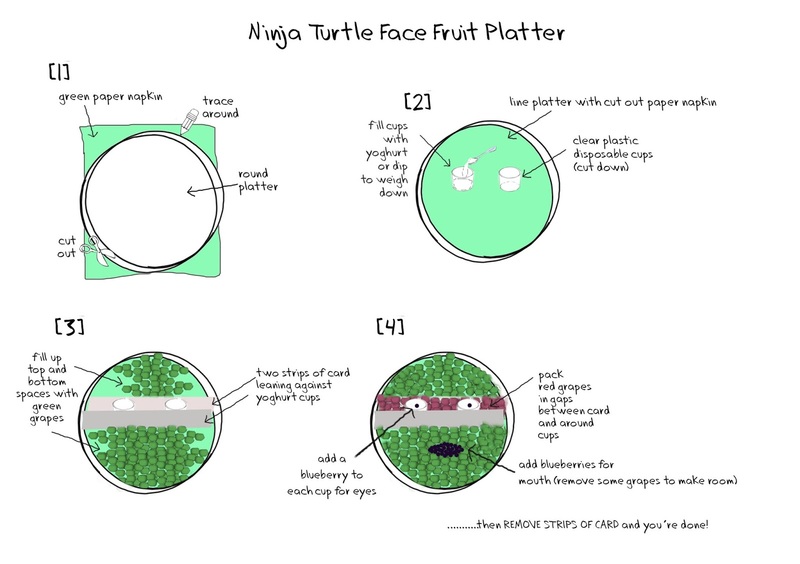 Roll out a lump of green fondant and press your ninja turtle cookie cutter (with embossing piece) into it. Repeat until you have four turtle faces. OPTIONAL: I used the embosser (and my fondant cutter) to stamp out coloured fondant for each of the turtle's masks. You could do with by colouring white fondant with a few drops of gel food colouring or alternatively, use edible pens to colour in the masks. I used my green metallic pen from Kiwi Cakes to enhance the features, and a dot of white chocolate ("Queen" squeezy tube) to add eyes. This was actually very simple to do - the turtle faces were the fiddliest bit, and probably would have been just as effective plain green embossed fondant, with no fussy fiddling with coloured masks (that was the trickiest part TBH). Anyway - the birthday boy (and his friends) loved it - which is what matters right?